Artist's concept of Mars Base Camp, a proposed space station that could be circling the Red Planet by 2028. THE WOODLANDS, Texas — In 2028, a space station could be circling Mars, if a new concept comes to fruition. As a prelude to human expeditions to the planet's surface, researchers aboard the proposed orbiting lab would aim to answer key questions about the complex world. 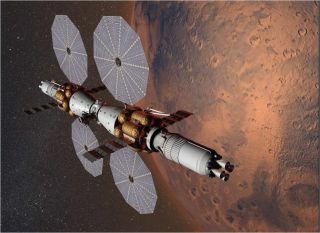 The six-person Mars Base Camp is led by researchers at aerospace giant Lockheed Martin, who unveiled the concept last year and fleshed out more details of the project here at the 48th Lunar and Planetary Science Conference (LPSC), held March 21-25. The Mars Base Camp is designed to vastly amplify the collection of imagery and scientific data from multiple sites on the planet over a full year of crewed occupation. In addition, samples of rock and soil that robots such as NASA's upcoming 2020 Mars rover collect on the Martian surface could be launched to Mars Base Camp, where crewmembers could examine them for signs of Red Planet life, project team members have said. "The discussion we're having here at the meeting is, how best can scientific discovery be enabled by having scientists in close proximity to mobile hardware on the surface of Mars or in the Martian atmosphere," Steve Jolly, chief engineer for civil space at Lockheed Martin in Denver, told Space.com. For example, a human field geologist on Mars would make quick decisions about which spots to explore, the best rock formations to study and where to dig for soil samples, Jolly said. "We want rovers under scientific control to behave in the same way." Details of Mars Base Camp, a concept led by researchers at Lockheed Martin. That's not possible when Mars rovers and their handlers are on different planets. one to two days the duties that asaid Ben Clark, chief scientist on the Lockheed Martin team studying the Mars Base Camp. Moreover, if the rover experiences a problem, there's a wait to find out what went wrong, followed by another wait as the issue is addressed, Clark told Space.com. Mars Base Camp residents could explore the Red Planet virtually through avatars and other immersive technology, the concept's architects say. Mars Base Camp astronauts could also interact virtually with Mars surface robots, using technology like that developed at Lockheed Martin's Collaborative Human Immersive Laboratory, Jolly said. In addition, Mars Base Camp would fly in a highly elliptical orbit that would allow it to "hover" over particular spots on the Red Planet for long stretches. During that time period, shifts of astronaut-scientists could execute tasks with surface robots and even aerial drones, Jolly said. Mars Base Camp astronauts could visit the Martian surface on two-week missions, thanks to a reusable sortie system that employs supersonic retropropulsion. On the Mars orbiting complex, crewmembers would be immersed in a continuous data flood from the rovers, and they'd have the feeling of being front and center on Mars, Clark said. "They'll have such good imagery, they'll be able to make decisions as they go," while probing a zone of interest, he said. Mars Base Camp astronauts could cover large distances and even reconstruct, via images, areas in great detail, he said. Clark foresees the use of avatars — electronic "Mars walkers" that are manipulated by a computer user in a virtual space. Those avatars could make up different field-exploration parties that tromp about virtually on the planet, he said. "Wearing goggles on the Mars Base Camp, researchers can decide where they want to be … point to another spot … give the right gesture, and you sort of teleport yourself to another place you want to be," Clark said. "Your body didn't move, but the terrain moved to where you want to stand." Artist's illustration of Mars Base Camp and reusable sortie rockets flying high over the Red Planet. "It's a precursor," Jolly said, pointing to other aspects of the Mars Base Camp scenario. Similarly, human excursions to Mars' two moons, Phobos and Deimos, are being assessed. Indeed, the Mars Base Camp architecture could support a diversity of missions to low-gravity bodies, Earth's moon, Mars and beyond, Jolly said. The Lockheed Martin plan invites international partners to contribute ideas to this human-rated interplanetary exploration system. "Now is the time to shape the future," Jolly said.